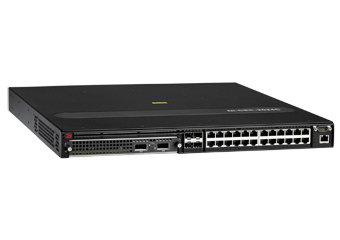 Brocade NetIron CER 2000 Series routers are purpose-built to help save on space, power, and cooling expenses while extending wire-speed IP and Multi-Protocol Label Switching (MPLS) services to the network edge without compromising performance. The NetIron CER 2000 is available in 24- and 48-port 1 Gigabit Ethernet (GbE) copper and hybrid fiber configurations with four or two 10 GbE ports. To ensure high performance, all the ports are capable of forwarding IP and MPLS packets at wire speed without oversubscription. With less than 5 watts/Gbps of power consumption and up to 136 Gbps of throughput, the NetIron CER 2000 meets the dynamic needs for high-bandwidth services while reducing the carbon footprint. A broad set of highly scalable IP unicast and multicast routing features, combined with a low total cost of ownership, makes the NetIron CER 2000 an ideal choice for service providers and enterprises that want to deliver Layer 2 and Layer 3 business services through a single, easy-to-manage platform. Software-Defined Networking (SDN) is a powerful new network paradigm that provides increased agility and programmatic control of network infrastructure for a new class of IT applications to meet critical business needs. The NetIron CER 2000 Series enables SDN by supporting the OpenFlow protocol, which allows communication between an OpenFlow controller and the OpenFlow-enabled NetIron CER 2000 router. The NetIron CER 2000 Series delivers OpenFlow 1.3 in hybrid mode, meaning organizations can simultaneously deploy traditional Layer 2 and Layer 3 forwarding with OpenFlow on the same system. This unique capability enables network operators to integrate OpenFlow into existing networks, providing the benefits offered by SDN for specific flows while the remaining traffic is routed as before.